Vancomycin is an anti-infective that is prescribed to patients. If the medication is not taken according to the order of the physician, it may cause signs and symptoms associated with the toxicity of the medication . The drug Vancomycin Hydrochloride is an example of a glycopeptide antibiotic. It is primarily indicated for the management of severe infections caused by strains of methicillin-resistant staphylococci. It is also given to patients who are allergic to penicillin and have failed to respond to other medications such as cephalosporins. Aside from these indications, vancomycin is also utilized for antibiotic prophylaxis before a surgical procedure. It is administered intravenously because it is poorly absorbed orally. It is metabolized by the liver and excreted through the kidneys. Side effects that can be experienced while taking this medication anaphylactic reaction, wheezing, indigestion, low blood pressure, and pain and spasm of the muscles of the back and chest [1, 2, 3,]. There are reported instances wherein intravenous vancomycin is administered too rapidly. The patient may experience flushing of the upper body, low blood pressure, and dizziness. This effect can be minimized by administering the medication more slowly . Vancomycin’s half-life in patients with normal renal function is about 4-6 hours. Its clearance in patients with impaired renal function may extend up to 54-180 hours. 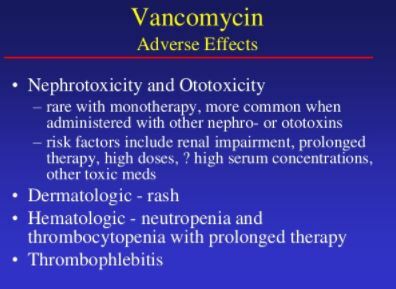 Renal clearance plays an important role in the possible toxicity for vancomycin. The therapeutic range of Vancomycin is between 10-20 microgram/milliliter. Its peak level is between 25-50 microgram/milliliter. Any level beyond this may cause toxicity signs and symptoms. Individuals who are at increased risk for vancomycin overdose include children and the elderly, those with impaired renal function, taking nephrotoxic drugs, those who are taking higher than the usual doses and those who have been taking the drug for more than 5 days [1, 4, 5]. When the level of vancomycin exceeds the therapeutic level, it may lead to the manifestation of toxicity signs and symptoms. These include phlebitis or inflammation of the vein where the drug is injected, reversible renal damage, neutropenia or low level of neutrophil, fever, rash, intestinal nephritis, and auditory toxicity. Taking vancomycin with aminoglycosides may lead to irreversible renal failure especially in individuals who are taking the drug for a long period of time [1, 3, 5]. When a patient manifests symptoms of vancomycin toxicity, the initial action is to measure the level of vancomycin in the patient’s system. This will indicate the severity of the patient’s toxicity is. The management of the patient depends on the symptoms that have manifested. Once the patient is stable, reducing the level of vancomycin will be done next. The best way to reduce the amount of vancomycin in the system is by performing hemodialysis. Referral to another specialist such as a nephrologist may be done especially if they have developed irreversible kidney damage. If the patient would still require an anti-infective, they may be prescribed another medication that is less damaging to the kidneys [1, 2, 3, 4, 5]. In order to prevent vancomycin toxicity, the physician should adjust the dosage of the medication to patients who have an impaired renal function. Other medications that the patient is taking should be known by the physician to prevent any untoward drug interaction. Any side effects experienced should be reported and addressed immediately to prevent the development of complications [1, 2, 3, 4, 5]. Taking vancomycin is beneficial for the patient but if it is not taken properly, it can cause harm to the patient. If you have more information about the overdose in vancomycin, you can share what you know in the comment section below. You can also check out overdoseinfo.com for more information about the overdose of other medications. Bunchman, T., Valentini, R., Gardner, J., Mottes, T., Kudelka, T., & NJ, M. (1999). Treatment of vancomycin overdose using high-efficiency dialysis membranes. Pediatric Nephrology, 773-774. Lemaire. (2010). Treatment of pediatric vancomycin intoxication: a case report and review of the literature. Clinical Kidney Journal, 260-264.